It’s Andrew Teale’s birthday today. Happy birthday, you might say. Unfortunately real life is not being very nice to your columnist at the moment: I will be made redundant later this month, and the course of the future (at the time of writing) is not yet clear. So, dear readers, how can you help? Well, if you have or know of a vacancy available that you think might suit the research skills and attention to detail demonstrated by this column, I would love to hear from you; do please get in touch with me by email or Twitter DM. If you’re not in a position to offer work, but haven’t yet got around to buying Andrew’s Previews 2016 (see the sidebar on the right), please do so; your investment will be amply rewarded. Whichever category you fall into, look out for the collection Andrew’s Previews 2017 which is coming soon. Clackmannanshire council; caused by the resignation of Scottish National Party councillor Archie Drummond for personal and family reasons. He had served since 2012 and was originally elected as an independent. Clackmannanshire council must be doing something right. This is the first Clackmannanshire by-election since 2004, when first-past-the-post was still in force. Accordingly Andrew’s Previews, which has been going in some form or other since 2010, has never previously been to the Wee County. It’s been worth the wait. Clackmannanshire’s five wards don’t have names to stir the imagination: they are called Central, East, South, West and North. The North ward is based on Tillicoultry and Alva, two of the Hillfoots Villages lying on the steep southern slopes of the Ochil Hills along the A91 Stirlng-St Andrews road. These were traditionally textile centres, although Alva’s main export is now beer from the Harviestoun Brewery: their Bitter and Twisted product has won CAMRA awards and comes highly recommended. To the south of Tllicoultry lies the River Devon, beyond which is the village of Coalsnaughton. This has traditionally been one of the stronger areas for the SNP: the local Ochil constituency (now Ochil and South Perthshire) was a longstanding Labour-SNP marginal until Labour collapsed in Scotland. 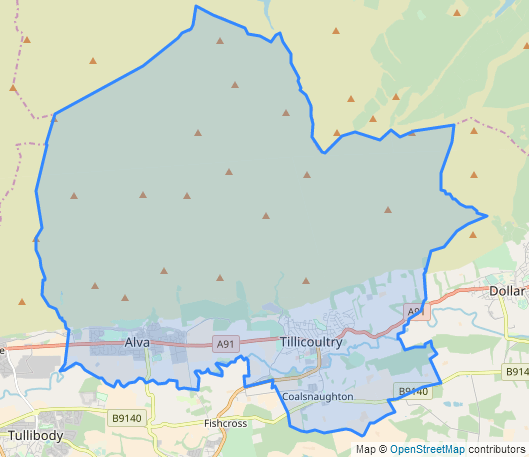 Much of that SNP vote will have come out of Tillicoultry and Alva which were strong Nationalist areas before proportional representation was introduced: in 2003 the SNP won all four of Clackmannanshire North’s predecessor wards. The introduction of PR in 2007 led to minority representation and a rather curious result: the SNP won two seats, Labour won one and the final seat went to the Liberal Democrats, who started in sixth place with just 7% of the vote but got transfers successively from Labour, the Conservatives and the SNP to beat the second Labour candidate on the final count. An accidental Lib Dem win there, and it was no surprise when they failed to repeat the trick in 2012. The Lib Dem seat was picked up that year by independent candidate Archie Drummond, who along with the single Conservative councillor found himself holding the balance of power on Clackmannanshire council: the SNP and Labour groups were tied on 8 seats each, with 10 needed for a majority. As a former SNP figure, Drummond put the Nationalists in control with a minority administration, and later rejoined the party himself. He was re-elected in 2017 on the SNP ticket, but the SNP stayed on two seats in North ward last year with Labour holding one and the final seat going to the Conservatives, whose candidate Martha Benny was elected on the first count. Shares of the vote were 40% for the SNP, 27% for Labour and 24% for the Tories. The SNP still run Clackmannanshire council as a minority administration, with 7 seats out of 18 plus this vacancy, so a loss for the Nationalists could put the administration under pressure. The Conservatives built on that surge of May 2017 to gain the Ochil and South Perthshire parliamentary seat the following month: that seat has now voted for three parties (Labour, the SNP and the Tories) in the last three general elections. The SNP hold the local Scottish Parliament seat, Clackmannan and Dunblane. Defending for the SNP is Helen Lewis, who was their third candidate here last year and contested East ward in 2012. The Labour candidate is local resident Afifa Khanam, a business and enterprise teacher at Glenrothes High School. The Conservatives have selected Alex Stewart; apparently no relation to the Mid Scotland and Fife MSP of the same name, Stewart is a former army figure who now runs a tearoom in Tillicoultry. Completing the ballot paper are Damian Sherwood-Johnson of the Lib Dems, who stood in this ward last year, and Marion Robertson for the Scottish Green Party. A reminder that Votes at 16 and the Alternative Vote apply to this by-election. Solihull council, West Midlands; caused by the resignation of Conservative councillor Alex Insley who had served since 2016. Insley is resigning for personal reasons: he is having to make several trips to Australia each year to care for his father, who is in poor health. For our first Englsh by-election of the week we are in the Birmingham stockbroker belt. This is a ward which has seen much development in recent years: the main centres of population, the Monkspath housing estate and the village of Dickens Heath, have been almost entirely developed in the last 35 years – making them younger than your columnist. 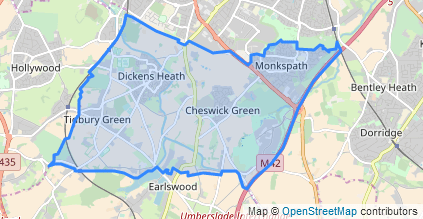 Dickens Heath in particular is a new village, with its first house occupied in 1998; it now has 3,245 electors according to the Notice of Poll. Many of the ward’s residents commute to Birmingham along the Birmingham-Stratford railway line, which lies on the ward boundary, although employment is also provided by a very large business park which has sprung up in the ward next to the M42 motorway at junction 4. 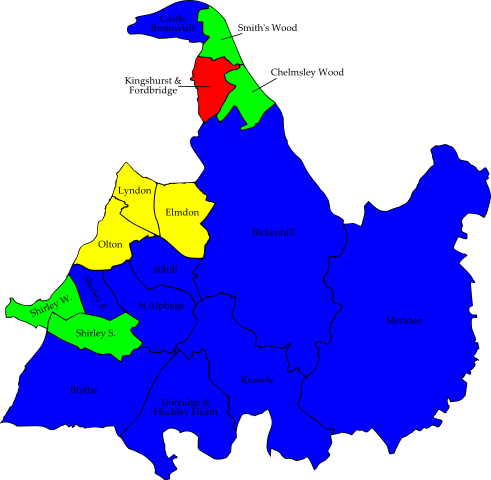 This being the West Midlands, as well as a commuter demographic the ward has relatively high Sikh and Hindu populations. Solihull is one of only two metropolitan boroughs with Conservative majorities, the party holding 30 out of 51 seats plus this vacancy. 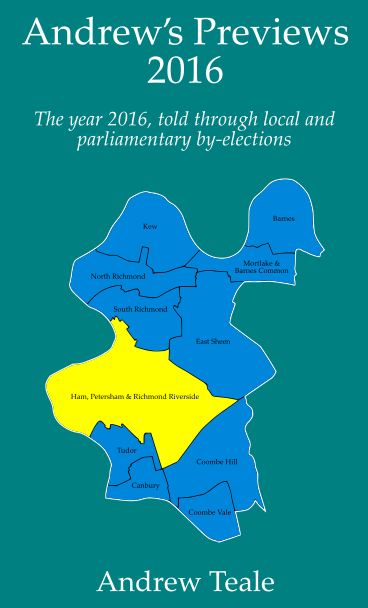 Despite the fact that Solihull town had a Lib Dem MP until 2015, the main opposition now is probably not what you might expect: it’s the Green Party, who have somehow managed to turn the Birmingham overspill estates of Chelmsley Wood into a Green stronghold and have also benefited from some Lib Dem defections in recent years. Some weird Parliamentary boundaries mean that Chelmsley Wood and this ward are both included in the same constituency: Meriden. Named after the River Blythe, Blythe ward was created in 2004 from parts of the former Packwood and Shirley South wards. It elected two Lib Dems out of three in the 2004 election, but the Lib Dems lost their seats to the Conservatives in 2008 and 2011. In recent years the opposition to the Conservatives here has come from the Solihull and Meriden Residents Association, which gained Blythe ward in 2012 and came close to winning a second seat in 2014. Alex Insley gained his seat from the Residents in 2016, defeating them 51-34 in vote terms. Defending for the Conservatives is James Butler. The Solihull and Meriden Residents Association has not returned to the fray, so Butler is opposed by Sardul Singh Marwa for Labour (who is standing here for the third time) and Charles Robinson for the Lib Dems. 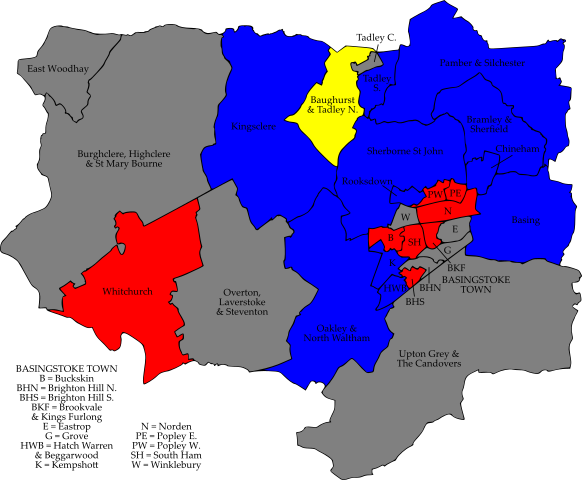 Basingstoke and Deane council, Hampshire; caused by the death of Conservative councillor Rita Burgess at the age of 74. An accountant, MENSA member and “adventurous sports” enthuasiast, Burgess was first elected to Basingstoke and Deane council in 1984 for Winklebury ward. She was defeated there in 1996 but returned to the council in 1999 and had represented Kempshott ward ever since, serving as Mayor of Basingstoke and Deane in 2002-03. Burgess was also a Hampshire county councillor for eighteen years. For our second Tory defence of the week we travel south to Basingstoke. Although it’s not a New Town, Basingstoke has many of the features of one: it was greatly expanded after the Second World War by London overspill. Kempshott ward, lying on the western edge of town, mostly dates fom the 1970s and early 1980s and makes the top 100 wards in England and Wales for owner-occupation (91% of households). The name of Kempshott ward recalls the Kempshott Park of an earlier era. This was the Hampshire base of the future George IV, who held the estate from 1789 and had his honeymoon with Caroline of Brunswick here. Kempshott House was renovated by the Prince allegedly to satisfy his mistress, Maria Fitzherbert; and Jane Austen – who attended a ball there in January 1799 – would probably have appreciated that. However, Kempshott House is no more, having been demolished to make way for the M3 motorway. 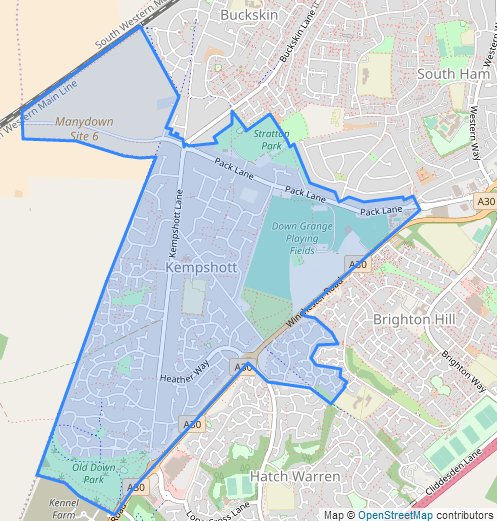 Kempshott ward took on its present boundaries in 2008 and the Conservatives have not been seriously challenged here since then. At the most recent election in 2016 the wonderfully-named Conservative councillor Wilhelmine Court was re-elected, defeating Labour 64-19. 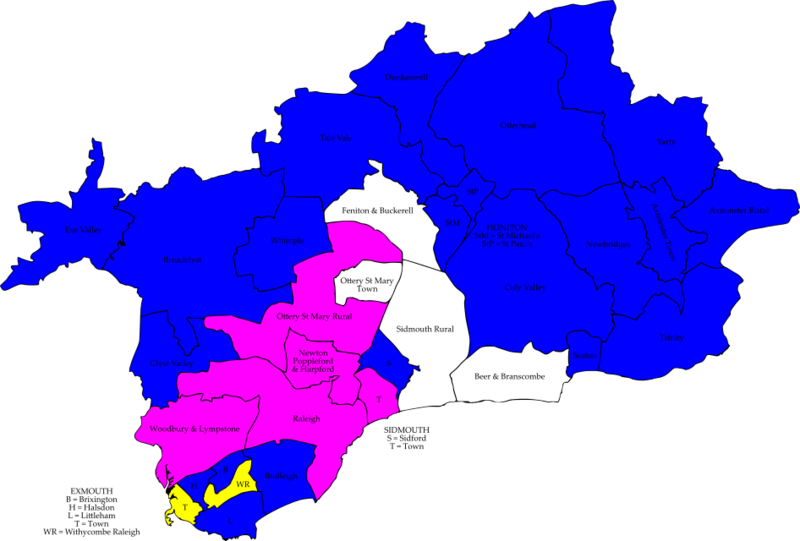 The ward is also part of a safe Conservative county division (Basingstoke South West). Defending for the Conservatives is Tony Capon, chief executive of a mental health charity. Labour have selected Grant Donohoe, a teacher; and the Lib Dems’ Stavroulla O’Doherty completes the ballot paper. East Devon council; caused by the resignation of Liberal Democrat councillor Pat Graham on health grounds; she has developed Parkinson’s disease. An Exmouth town councillor since 1997 and former Mayor of Exmouth, Graham had served on East Devon council since 2003. She is also a long-serving chairman of Exmouth in Bloom, and in 2015 was appointed MBE for her work with the group. We started this week on the River Devon, and we end it at the mouth of a river in Devon. A tourist centre in season – which we are not – Exmouth is generally a retirement centre and a commuter town for Exeter. This is an old port with a surprisingly international history: Byzantine coins from the sixth century have been found in Exmouth, and in the mid-seventeenth century Algerian pirates regularly raided the coast and shipping in the area. The Town ward covers the town centre and a large part of the Exe estuary, which is a nature reserve full of wading birds. 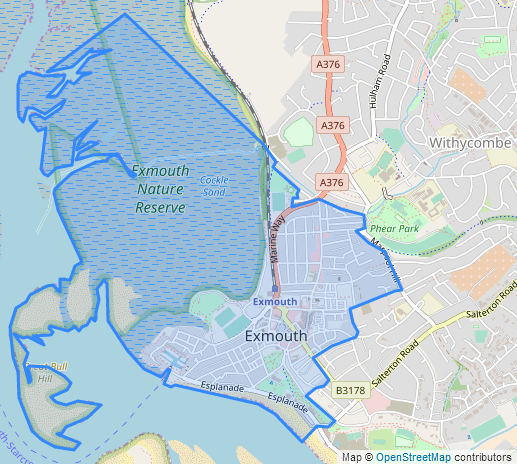 Exmouth Town was has been a Liberal Democrat ward for many years, but the party’s grip on the ward slipped in 2015 when one of the three Lib Dem seats was lost to the Conservatives. The two remaining Lib Dem councillors had clear personal votes and ran over 200 votes ahead of the party’s third candidate. We saw in Bridport last week that the Liberal Democrats can have problems holding seats in those circumstances, and here we can add political fragmentation to the mix: the Lib Dems topped the poll in 2015 with just 31%, to 25% for the Conservatives, 23% for the Greens and 21% for Labour. Last year’s county elections will give cheer to the Tory challenge, as they gained a seat from the Lib Dems in the Exmouth county division; on the other hand, the Conservative performance in the 2017 general election was nothing to write home about with a very strong second place in the local constituency for independent candidate Claire Wright. The Lib Dems, Conservatives and Green have all selected Exmouth town councillors for this by-election. Tim Dumper is the defending Lib Dem candidate, the Tory nominee is Tony Hill and the Green candidate is Robert Masding. Labour candidate Dilys Hadley isn’t an Exmouth town councilloe but would like to be one, as she is also standing in a town council by-election today. Completing the ballot paper is independent candidate and retired teacher Daphne Currier.